The 2011 Hyundai Veracruz distinguishes itself from three-row competitors, such as the Honda Pilot and Toyota Highlander, with premium-like accommodations, a less rugged shape and feature-based value. The Hyundai VeraCruz is an Excellent Crossover SUV. I love the comfort of my vehicle. It is easy to drive and it has a lot of wonderful features. I love the heated seats on cold winter mornings in the mountains. I love my sunroof and there is plenty of space for the groceries and other items in the back. I also love the 3rd row seating option for traveling with other friends. This vehicle is one of my favorite vehicles I have ever owned. The only downside to the vehicle is the gas mileage but I expected that when I bought it because it is a 6 cylinder and I was upgrading from a 4 cylinder. The Veracruz is overall a nice vehicle. The seats are very comfortable with nice leather interior. It is very roomy, easily fitting 3 car seats across the back seat with plenty of room in the third row. 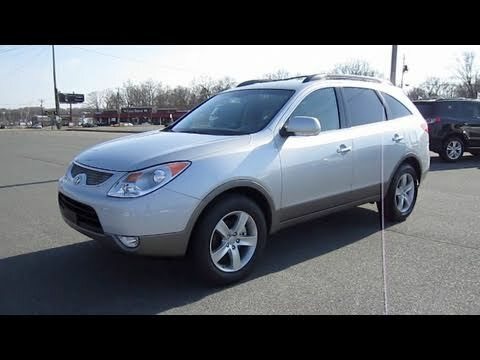 My only complaints are the lack of trunk space when the third row is up and the key fabs often do not work this car has been very reliable and I have never had any major mechanical issues with it. I have been driving this for about a year and have been very happy with its performance. I did summarize the very Cruz. We love our very Cruze. It has a third row seat that folds down. This allows much room in the cargo area for many things. We like having separate temperature controls for the front and the back for the passengers. The car is comfortable we use this vehicle when we travel as a family of six adults. It has plenty of legroom. CURT MANUFACTURING IS RECALLING CERTAIN TOW PACKAGE WIRING HARNESSES, PART NUMBER 56024, THAT CONNECT TOW VEHICLE LIGHTING CIRCUITS TO TRAILER LIGHTING CIRCUITS SOLD FOR USE ON CERTAIN MODEL YEAR 2009 THROUGH 2011 HYUNDAI VERACRUZ AND KIA SORENTO VEHICLES. THE UNITS ARE NOT WATER-TIGHT AND MOISTURE CAN SEEP INTO THE CONVERTER MODULE AND DEFEAT THE MODULE'S INTERNAL CIRCUIT PROTECTION.